Scientists have responded in a big way to NASA's call to help reformulate its Mars robotic exploration strategy, submitting about 400 ideas and Red Planet mission concepts to the space agency. NASA's Mars program suffered deep cuts in President Barack Obama's proposed 2013 budget, which was released in February. In response, NASA pulled out of the European-led ExoMars mission, which aims to launch an orbiter and a rover to the Red Planet in 2016 and 2018, respectively. The agency also undertook a broad rethink of its Mars strategy, to figure out how best to explore the Red Planet with reduced funding. NASA asked the scientific community for ideas and was expecting to get about 200 proposals at its recent Concepts and Approaches for Mars Exploration Workshop in Houston, officials said. "This strong response sends a clear message that exploring Mars is important to future exploration," said John Grunsfeld, associate administrator for NASA's Science Mission Directorate, in a statement. "The challenge now will be to select the best ideas for the next phase." The ideas that survive the first cut will be presented during a workshop held June 12-14 in Houston. The workshop will help NASA's Mars Program Planning Group (MPPG) develop options for a strategy for exploration beginning as early as 2018, and stretching into the next decade and beyond, officials said. The MPPG will be guided in part by the goals laid out by the U.S. National Research Council's Planetary Science Decadal Survey, which was released in 2011. The survey ranked a Mars sample-return mission as a top priority. President Obama has also charged NASA with getting astronauts to the vicinity of Mars by the mid-2030s. The MPPG is expected to produce a report by the end of the summer. This report will be assessed by a team of NASA officials in charge of the agency-wide Mars reformulation strategy. Grunsfeld chairs this group, which also includes Bill Gerstenmaier, associate administrator for NASA's Human Exploration and Operations Mission Directorate; NASA chief scientist Waleed Abdalati; and NASA chief technologist Mason Peck. This attempt to figure out its long-term Mars plans won't affect NASA's Red Planet efforts over the next few years. 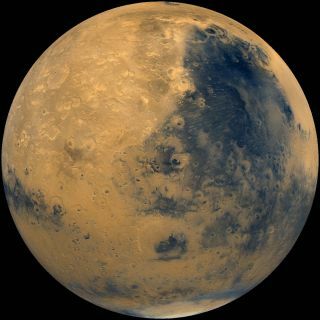 The agency's 1-ton Curiosity rover, for example, is slated to land at Mars' huge Gale Crater on the night of Aug. 5 to assess the Red Planet's habitability. In 2013, NASA will launch the Mars Atmosphere and Volatile Evolution (MAVEN) orbiter, the first mission devoted to understanding the Martian upper atmosphere. And the agency's Opportunity rover, which landed on the Red Planet in January 2004, is still chugging along. It's currently exploring the rim of the 14-mile-wide (22-kilometer) Endeavour Crater.